Nikon has established a name for itself as a behemoth in the manufacture of high quality and precision optics and imaging products, therefore, you can expect good performance from any of their products. 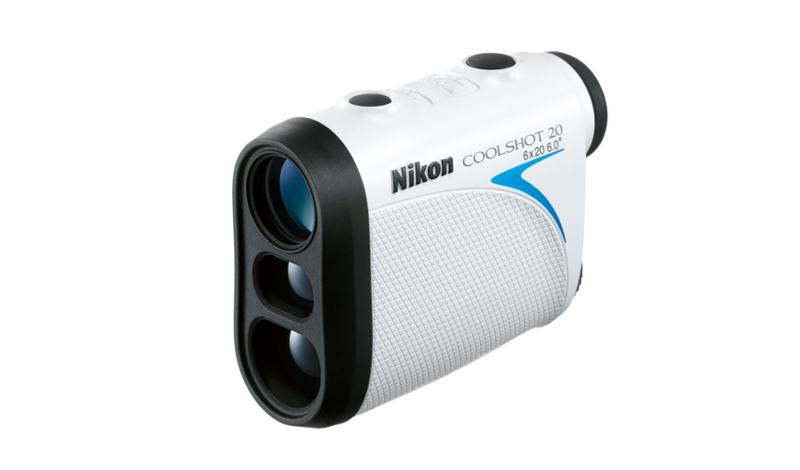 The Nikon COOLSHOT 20 is the smallest, most compact and most affordable rangefinder in their range of options. 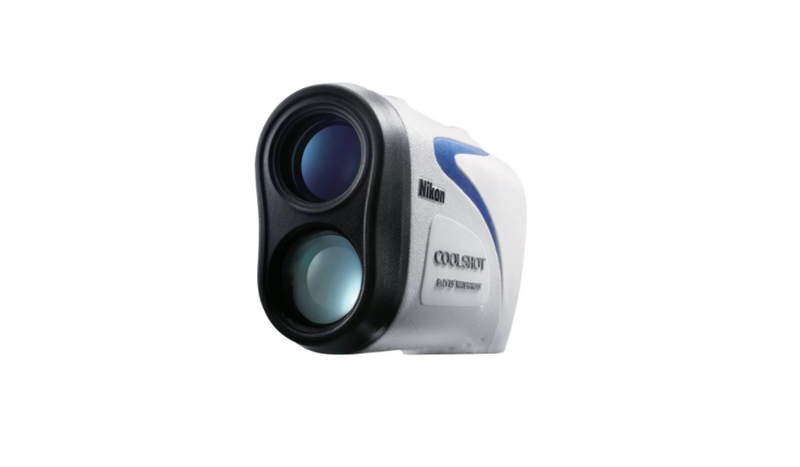 Despite its small size and very affordable price, the COOLSHOT 20 is a reliable unit that offers precise measurements and shot-to-shot convenience on the course. Learning to use the COOLSHOT 20 should be quick. Those who have used it have left raving reviews. Read on to see our review of the Nikon COOLSHOT 20. Click Here to See Our List of the 5 Best Golf Range Finders. Measuring just 2.9” x 1.5” x 3.6” and weighing a mere 4.4 ounces, the COOLSHOT 20 is one of the smallest rangefinders, not just among the Nikon range of products but in the entire rangefinder market. Its shape and ergonomic design ensure that it fits comfortably in one hand. The small size also gives it an advantage over other rangefinders because it is thin enough to easily fit in a jacket or trouser pocket without feeling uncomfortable. However, for people with large hands, it might feel a tad too small and awkward. It has a clean and simple black and white color scheme, with a white body and a black eyepiece and reticules. The top side of the COOLSHOT 20 is fitted with two buttons for operating the device. The front mode button is used for toggling between yards and meters. The rear button is used for powering on the device and for shooting the laser at your target. The bottom side of the device is textured to ensure there is plenty of grip. The eyepiece is designed to be comfortable for those wearing glasses.However, for those who want to view using the naked eye, they can adjust the focus to accommodate any long or short sightedness. Below the eyepiece is the battery compartment where the standard CR2 battery is slotted. The battery will provide months of usage without the need for recharging. The COOLSHOT 20 has a rainproof cover which also offers protection against minor impacts. It also comes with a strong nylon carrying case with a heavy snap front flap and an adjustable Velcro rear loop which allows the rangefinder to be attached to a bag or belt. The COOLSHOT 20 provides 6x magnification through an integral 6-power Nikon monocular lens that has multilayer coating, resulting in bright and crisp clear images. The device has a range of up to 550 yards. While this is not as far as the COOLSHOT, most people rarely hit that far. The COOLSHOT 20 also features an 8 second Continuous Scanning Mode, which comes in handy when you are trying to find the distance to multiple objects, such as the trees, the flag, hazards and mounds. In this mode, you only need to press the power button and the device will continuously measure distances for 8 seconds as you pan across the course. Another impressive feature on the COOLSHOT 20 is the First Target Priority Mode. This revolutionary technology provides the distance to the nearest targeted object when there is a group of objects in the targeted direction. This is extremely important when measuring the distance to the flag when there are trees behind the flag. It is important to note that that the COOLSHOT 20 is not the fastest when it comes to locking on the target. However, it is still effective, therefore this is unlikely to pose a problem. The device also has an auto power down feature, which automatically shuts down the device after 10 seconds of inactivity. This improves the battery efficiency to make sure the device can be used for a long time without requiring a charge. Versatility: Apart from ranging the flagstick, the COOLSHOT 20 can be used to range any objects within sight, including golf carts, trees, lakes, hills, bunkers, doglegs, etc. It does not even require reflectors to lock on the flagstick. Compact and light weight: Since it is small and light weight, it is a convenient device to carry around either in your pocket or in the bag. USGA compliant:The device does not have the Slope feature, therefore it is compliant with rule 14-3 of golf tournament play. Weatherproof: The device is built using rainproof materials and has a wide temperature tolerance, therefore it can be used even in inclement weather without the risk of getting damaged. Ease of use: The small, ergonomic design makes this device easy to use and offers a comfortable grip. Operation is easy with the two buttons which are strategically placed on the top of the rangefinder. It also gives readings in both meters and yards, making it suitable for everyone. Price: The COOLSHOT 20 is one of the cheapest rangefinders available on the market. Two year warranty: Nikon provides a two year warranty covering any defects in workmanship or materials. It can feel too small or too light, thereby affecting stability and making it difficult to focus. Target acquisition beyond a certain distance becomes very difficult. The accuracy drops to plus or minus 2 yards when the distance exceeds 100 yards. It has no on-screen target lock confirmation mechanism. There is no way to adjust the brightness of the display. 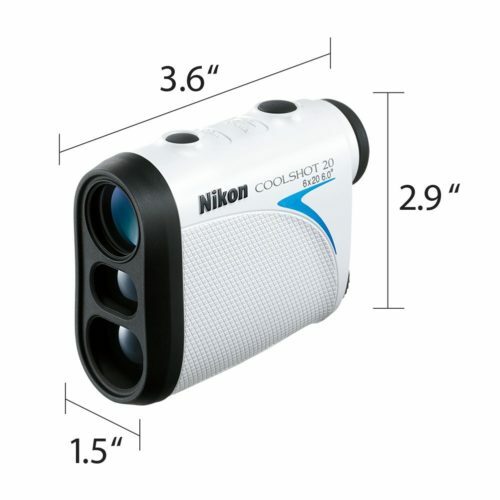 The Nikon COOLSHOT 20 golf laser rangefinder is a great choice for golfers who are looking for a good rangefinder without committing to a hefty price tag. Those who have had experience with its predecessor, the COOLSHOT will find the COOLSHOT 20 as a worthy upgrade because it delivers the same performance, but in a design that is convenient to carry around. It is a great entry-level rangefinder that will help amateur golfers up their game and lower their handicap.It is definitely a device worth considering. I hope that this review of the Nikon COOLSHOT 20 has provided you with the information you needed. 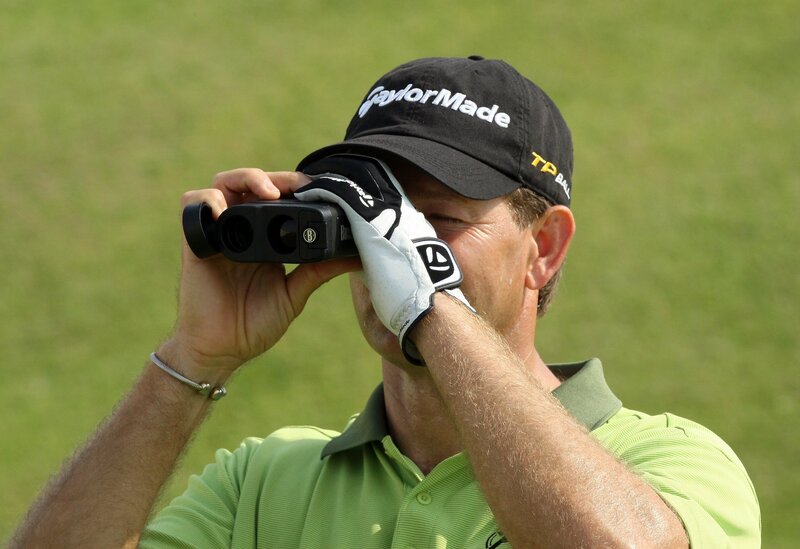 It is always my goal to help you find the best laser rangefinders for your golfing needs.